On this page I'll list the band's CDs.A track list, and my own comments. I'll also TRY include a sample sound file, if I can get my hands on one. Jump5 " All The Time In The World"
Jump5 " Kareoke , Vol. 1 "
1.- Jump5 " self-titled "
3. " Change A Heart , Change The World "
4. "The Meaning Of Life "
5. "All I Want "
6. "Wish That I could Read Your Mind "
7. " Tell Me Why "
8. "I Belong To You "
9. "Love Ya To Much "
10. "When I Say Your Name "
12. "God Bless The USA "
Many a group has their beginnings when like-minded youth cross paths in high school or even junior high. Those beginnings for Nashville's Jump5 started before kindergarten, when Brittany Hargest (then 2) and her brother Brandon (then 4) met Lesley Moore (then 4) at dance class. Talent shows and recitals would introduce them to Libby Hodges and Chris Fedun. All the youngsters would study dance, music, and gymnastics, and would land roles in commercials and music videos. Before long, they reached a consensus to form their own group. 2. -Jump5 " God Bless The USA "
3.- Jump5 " All The Time In The World "
1. "All I Can Do "
2. " Throw Your Hands Up "
3. " Summer Song "
5. "Angel In My Heart "
6. " Put Me In The Picture "
7. " Forever In My Heart "
Jump5 toured throughout much of 2002, homeschooling took care of their educational needs, appearing with the likes of the Baha Men, A-Teens, and Aaron Carter. The group's follow-up disc, All The Time In the World, was released in the summer of 2002 and landed on the Top 200 Album chart. The disc kicks off with an excellent dance track: All I Can Do. It has a hard-to-sit-still beat and a burbling bass, and features an uplifting chorus and a key change that adds extra pep at just the right moment. The next song, Throw Your Hands Up, resonates with a distinct urban vibe and gives the two boys in the band a chance to solo out a little; meanwhile, Summer Smile has a catchy shuffle beat and a strong guitar presenceits a little reminiscent of Vitamin C, which isnt a bad recommendation. The ladies provide some creamy vocals on Joyride, another great dance number with a freedom theme. Angel In My Heart is a soft ballad with an urban feel and the expected flourishing chorus. This one has a high romance quotient! Put Me In The Picture goes the slow-dance-groove route while Forever In My Heart kicks it up a little without losing any of the sweet taste that runs right through the album. Its definitely one of the catchiest songs on the disc. At the more electronica end of the spectrum, Diamond moves in surges rather than hooks. The album closes out with remixes of Throw Your Hands Up, Joyride and All I Can Do, with the three songs getting tasty electronic facelifts. The Jumpsters totally want you to finish up dancing. The entire album is marked by excellent production work (primarily by Mark Hammond) and programming. Its slick and sharp from start to finish. Heres a CD thats guaranteed to chase away the blues. All The Time In The World is a tight set of feel good songs that should take Jump 5 a leap further along the stardom road. 6. 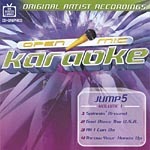 - Jump5 " Open Mic Kareoke CD ~Vol.1 "
7. -Jump5 " Accelerate "
1. " Do Ya "
2. " We Are Family "
5. "Why Do I Do "
6. " Way Of The World "
7. " Walking On Sunshine "
8. "Every Part Of Me "
9." All Because Of You "
10. " Shining Star "
I would list all of the songs , but I just did , and there are to many , and they are all good !!! !If u go to Walmart.com , and go the the music section , type in Jump5 , and they have MP3 audio's , so you can listen to Jump5's music !!!! I love all of the cd's , but I especially love " All The Time In The World " , and " Accelerate "!!!!! In this area I'll talk about my favorite CD by this band. 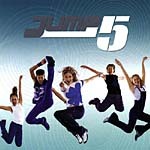 My Favorite CD' by Jump5 are " All The Time In The World " and " Accelerate "!!!!!!
" All I can Do "
" Walkin on Sunshine "